Sectarian violence is decreasing across the Middle East, if largely due to mass displacement and harsh settlements imposed in states emerging from conflict. Alongside this decrease, an aggressive strain of transnational sectarian politics which has gripped the region for the past few decades is abating, at least for now. But while in principle, this lull creates a space for alternative forms of collective action to emerge, in practice, the region remains bound to the identity politics that have permeated its international relations for the better part of a century. Identity politics – both domestic and transnational – are frequently held accountable for the region’s longstanding susceptibility to conflict. When drawing borders after World War I, colonial powers showed little regard for existing sub and supra-state ethnic and religious identities. Roughly 60% of the Middle East population speak Arabic and consider themselves to be Arab; 90% are Muslim and 85% of those identify themselves as Sunni. As a result, the Middle East is unique in the extent to which political actors have historically been able to emphasise particular traits of group identity to appeal to populations in other states. Identity politics are used across borders in order to forge constituencies, attract patrons, and generally leverage support in direct bids to undermine state sovereignty. In the process, non-Arab, non-Muslim, or non-Sunni/Shi’a designated ‘enemies’ are alienated. Within the past 15 years, Sunni versus Shi’a sectarian narratives of conflict have seemingly displaced more inclusive forms of pan-Arab and pan-Islamist identity politics at the regional level. Clearly, this has only been possible due to the societal dynamics and demographics of conflicted states including Syria, Yemen, Iraq and Bahrain. Rival domestic claimants for public authority have politicised what were previously banal markers of religious identity, with agendas and insecurities of external players crystalising divisions. The recent surge in transnational sectarian politics is a function of both state and non-state actors. The ideational rivalry between the Iranian and Saudi leaderships post-1979 has revolved around their respective claims to champion pan-Islamist causes. While these efforts achieved some measure of success when confronting non-Muslim ‘enemies’ (e.g. Israel and the invading Soviet forces in Afghanistan), they have been less tenable with respect to internal conflicts within Muslim states, where fault lines have often emerged along sectarian divisions. At a societal level, the region-wide rise of radical militant Salafi jihadism has come in the context of political Islamist groups failing to achieve rule peacefully within the existing state system framework. While Salafism has always been particular to Sunni Islam, the vision of an Islamic caliphate put forward by Al-Qa’ida was initially premised on the inclusion of all Muslims, irrespective of sect. The 2005 declaration of all-out war against the Iraqi Shi’a by former Al-Qa’ida in Iraq leader, Jordanian-born Abu Musab al-Zarqawi – against Bin Laden’s advice – represented a turning point for the movement which profoundly shaped the conflicts in Iraq, and later Syria. Affirming that transnational identity politics drive instability and contribute towards the outbreak of conflict is quite different from positing that group differences in themselves cause conflict (as proposed in Huntington’s ‘Clash of Civilizations’ thesis). Gartzke & Skrede Gleditsch, for instance, note that ‘violence is more likely among states with similar cultural ties, even when controlling for other determinants of conflict’ (2006: 53). And while their study refers to conflicts between rather than within states, others have similarly disputed that ethnic diversity is a causal driver of civil war (e.g. Fearon & Laitin 2001; Fox 2003). So while conflicts do often occur between groups espousing different identities, religious, ethnic and linguistic diversity within societies is far more common than conflict. What seems much more important to understand is how, amongst an infinite possible number of differences, a few become salient (Bateson 1979: 98). Entrepreneurs of identity politics do not simply appeal to pre-existing categories of identity-based groups; they interpellate identities, imbuing them with values and beliefs. In a 2015 article on Identity and Ideology in Political Violence and Conflict, Jonathan Leader Maynard challenges crude representations of identity rooted in ‘ancient hatreds’ as a driver of conflict. He argues that ‘identity construction is… about the ideological conversion of certain lines of difference into politically and psychologically relevant axes.’ On this basis, he suggests six mutually reinforcing causal mechanisms through which identity can encourage violence: mobilization coordinates; targeting categories; virtue systems; obligation hierarchies; victimhood and group hatred. In effect, while differences in themselves are not cause for violence, they provide a means by which to strategise violence. Drawing from conflicts in the modern Middle East, below are a few examples of how variations of pan-Arabism, pan-Islamism, and latterly sectarianism have been rhetorically deployed by regional actors in the ways suggested by Maynard to invoke or justify conflict. The Six-Day War (1967): At the height of Arab nationalism and in the lead up to the second Arab–Israeli War in 1967, Egyptian President Gamal ‘Abdul Nasser used the Sawt Al-Arab radio station to espouse pan-Arabism across the Middle East in support of liberating Palestine . The station’s broadcasting was designed to mobilise popular sentiment against Israel and the imperial powers backing it, and to use the Zionist label as a targeting category justifying group hatred against Israel, advocating ‘the extermination of Zionism in the second round of the Palestinian war’. Iran–Iraq War (1980–88): Using the rhetoric of Arab unity, the Iraqi Ba’ath party leadership cited the large ethnically Arab population in the south-western oil-producing Iranian province of Khuzestan as a justification for their invasion. Conversely, Iranian Supreme leader Ayatollah Khomeini appealed to the virtue system of pan-Islamism to justify prolonging the war after the initial Iraqi invasion had been repelled. At the same time, however, both sides also appealed to their own populations to remain loyal to the state, and in practice, calls for national identity carried most weight. Soviet–Afghan War (1979–89): The radical Sunni strand of pan-Islamism gained considerable traction across the Middle East as a result of the Soviet–Afghan War. Palestinian scholar Abdullah Yusuf ‘Azzam, so-called ‘Father of Global Jihad’, issued a fatwa when Soviet forces invaded Afghanistan declaring ‘defensive jihad’ in Afghanistan a personal obligation for all Muslims. ‘Azzam identified an obligation hierarchy for foreign mujahideen: he told them that while they should consider jihad in Palestine their highest duty, due to the practical difficulties of accessing Palestine, they should instead come to Afghanistan to fight the invaders. Israel–Hezbollah War (2006): Despite the widely mooted demise of pan-Arabism after the defeat of the Arab armies at the hands of Israeli forces in 1967, pan-Arab sentiment was strong in the light of Hezbollah’s war against Israel in 2006. Despite attempts by the Egyptian, Jordanian and Saudi leaderships to discredit it, Hezbollah gained enormous (albeit temporary) popularity across the Arab world by stressing its Arabness (as opposed to its Shi’aness) and by raising the status of the (Sunni) Palestinians as victims of an oppressive Zionist force. 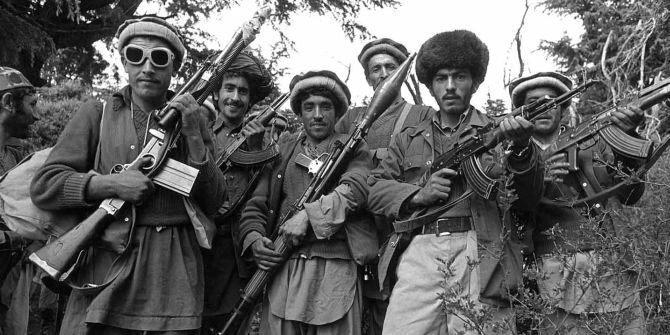 Mujahideen in the Afghan-Soviet war. The examples above point to instances of politicising Arab and Islamic identities in the ways suggested by Maynard in order to invoke or justify conflict. They also suggest that attempts to leverage ideologically informed identities on a transnational scale are often unsuccessful. Even if they are initially persuasive, over time the ideology justifying differentiating between identities may lose pertinence or credibility, even if its effect of fracturing communities is seemingly irreversible. And yet, despite the fact that entrepreneurs of identity politics – particularly when they are ruling elites – often appear to be ‘exposed’ as insincere, the underlying sources of identity recur again and again in the region’s conflicts. The example of the 2006 Lebanon War demonstrates that Arabism, while it may have evolved, is not ‘dead’: it can be effectively revived to popular acclaim so long as the main ‘enemy’ at hand is neither Arab nor Muslim. Several factors have led to the current move of ruling elites away from sectarian politics. They include the much touted ‘end of ISIS’, the increased Russian influence in Syria and corresponding reduction of Iranian and Hezbollah’s influence, and the rupture of the Sunni front following the diplomatic rift between Qatar and Saudi. In a new rhetorical battle carried by Arab satellite channels, Qatar has dropped anti-Iranian narratives in favour of a campaign against the alleged hypocrisy of the Saudi monarchy’s authoritarian brand of Wahhabism. The Saudi media, on the other hand, is maintaining an onslaught against Iran but also attacking Qatar’s continued sympathies and sponsorship of jihadi ‘terrorist’ groups – by which it primarily means the Muslim Brotherhood. This change of direction, however, should not be read as evidence that sectarianism has been ‘defeated’. Rather, it is indicative of political actors’ constant reassessment of the regional – and the domestic – threat environment, in which different brands of identity are brought into focus to address different types of enemy. Ultimately, ruling elites in the Middle East have recurrent recourse to identity politics because of their own legitimacy deficits; and so long as these deficits prevail, there is little prospect of a transnational language of participatory politics emerging.